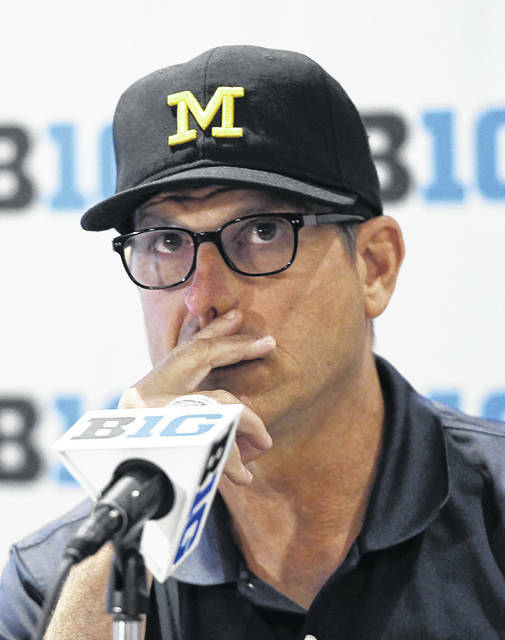 CHICAGO – The things everyone wanted Jim Harbaugh to talk about seemed to be some of the last subjects he wanted to discuss at day one of the Big Ten football media days on Monday. Those things are Michigan’s 1-5 record against its two biggest rivals, Ohio State and Michigan State, since Harbaugh became the Wolverines head coach in 2015 with the mission of restoring Michigan to the position it once held in the college football world and just how long will it be until highly regarded transfer Shea Patterson is named his starting quarterback. Later in a smaller group interview he did admit the frustration his teams have felt against their two biggest rivals does provide some motivation. “It drives us quite a bit. We want to win, we want to win multiple championships,” Harbaugh said. Patterson transferred to Michigan this winter from Mississippi and was declared eligible for the 2018 season after a lengthy appeal because of numerous NCAA sanctions against the Rebels’ football program. He passed for 2,259 yards and 17 touchdowns last year before a knee injury ended his season after seven games. Patterson, who lived in Toledo until he started high school, appears to be the best quarterback Harbaugh has had at Michigan. But on Monday, he was just one of the guys competing for the starting job when Harbaugh talked about him. In fact, he hardly talked about him at all. The classic Harbaugh response to one of the questions about Patterson was to talk about the offensive line, the defensive line and what a great job the team nutritionist was doing. “The thing I think about most this time of year is the lines – the offensive and defensive lines. They’re really coming along. The good players have taken leadership roles. Long story short, it’s been a good summer for them,” he said. * Former Ohio State offensive coordinator and offensive line coach Ed Warinner’s knowledge of OSU’s offense was not the only reason he was hired as Michigan’s offensive line coach for this season. “He has coached against all the teams we play. He’s got a good knowledge of the Big Ten. It was a factor but it wasn’t the biggest factor,” Harbaugh said. * With a Supreme Court decision loosening restrictions on sports gambling, Harbaugh said his advice to his players is simple. “As far as gambling, don’t associate with gamblers, avoid it like the plague. Don’t walk away from that, run,” he said.